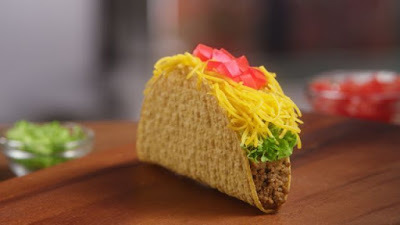 Drawing inspiration from their very first taco version from over 50 years ago, Del Taco introduces the new The Del Taco. They're describing it as "a bigger, fresher, and better-tasting crunchy beef taco, worthy of the brand's name." Replacing their Double Beef Classic Taco, The Del Taco features more seasoned beef, more fresh-grated cheddar cheese, lettuce, and chopped tomatoes on a bigger, crunchier corn shell. Seasoned turkey can be substituted for seasoned beef with no extra charge. The suggested price for the new taco is $1.39. Del Taco currently has a buy one, get one free coupon for The Del Taco on their website but you have to be enrolled in their email list to access it.